In this article we will cover store-and-forward telemedicine. 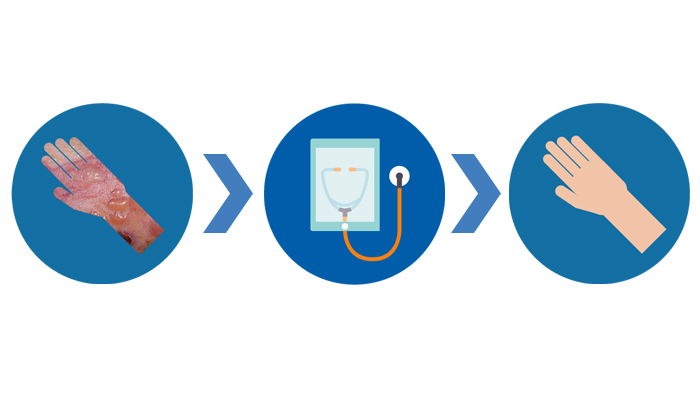 Store-and-forward telemedicine is an asynchronous way to interact between doctor and patient. The approach is similar to email – the patient sends over their medical images and necessary clinical details, and physician reviews them at a later point. Now, you might wonder: If store-and-forward telemedicine is just like email, then why can’t we simply use email to communicate with patients? That’s because email is not secure and does not meet the security requirements of HIPAA (Health Insurance Portability and Accountability Act). HIPAA security is a complex topic, which we will cover in depth in a later article. Suffice it to say that physicians cannot just use email and text messages to provide treatment or gather patient medical information. But wait, you may say that you just saw your child’s pediatrician and she told you to “just text” her issues and pictures using standard unsecure MMS messages. Depending on the rules of your state’s medical board, a physician may be allowed to use supplemental unsecure methods of communication such as email or text with their patient, but only if the patient explicitly authorized the use of such communication. That said, the American Medical Association (AMA) guidelines generally advise against using unsecure or public connection to transmit patient data. Violators may lose their medical license or be disciplined by their medical board. In addition, a physician’s medical malpractice insurance may explicitly forbid the use of unsecure communication since it opens up another area of legal liability. For all these reasons, we strongly recommend only using secure HIPAA compliant software for communicating with patients and transmitting patient data. Store-and-forward telemedicine is often compared and contrasted to real-time telemedicine. One popular impression is that real-time telemedicine uses video while store-and-forward does not. This is not strictly true — store-and-forward technologies are able to use the same communication mediums such as video and voice as real-time telemedicine. In fact, from a technical perspective, store-and-forward uses many more mediums compared to real-time, including photos, medical images, forms, etc. The key difference between the two is that in store-and-forward telemedicine the medical provider and patient do not need to be available at the same time. That said, most store-and-forward telemedicine software solutions and usage models do not include video or voice components from patient to physician. The most likely reason is because video and voice recordings take longer for physicians to review than plain text, pictures, and raw data. Most often store-and-forward video and voice is used for communicating in the other direction — from physician to patient. One authentic example of store-and-forward video is patient discharge instructions. Patients leaving the hospital are required to receive often-lengthy written discharge instructions. By the time the patients get home, they may have lost their paperwork or forgotten certain specifics. Luckily, with asynchronous telemedicine, having the instructions available on video gets around this problem. The medical specialty that has experienced the largest boom in store-and-forward telemedicine, starting with the rise of the Internet in 1990s, is radiology. Most radiologists today use modern store-and-forward telemedicine software to see cases from a remote location. Asynchronous telemedicine is also used when a general radiologists needs a consult from a sub-specialist, such as a pediatric radiologist. The significant shift of this specialty towards the regular utilization of telemedicine has resulted in major changes to the practice of radiology. The market for imaging procedures has been growing 15% annually despite only a modest growth of 2% in the number of radiologists. Another change in radiology has been the expectation and pressure for 24/7 availability. Physicians in emergency departments of many hospitals can order images in the middle of the night and send them to a radiologist expecting a turnaround of minutes or hours. This on-call availability has had a negative quality of life impact on radiologists. To solve this issue, firms have sprung up offering off-site teleradiology and on-call services, popularly called nighthawk radiology services. Such firms have radiologists on staff who hold medical licenses in multiple states. This allows a firm to maintain a large case volume by receiving cases from around the country. Radiologists work in shifts, which allows practices to significantly reduce or eliminate the on-call time for any individual radiologist. From a patient perspective, convenience and access to care is one of the biggest benefits. By taking advantage of a virtual store-and-forward visit, patients minimize the interruption to their already busy workday. One example in dermatology are acne follow up visits. Patients schedule the visit, travel to the physician office, wait in the waiting room, wait in the exam room, and the result is almost always the same – things look as expected and prescription is renewed or changed. These types of visits are ideal for store-and-forward telemedicine – they are patients with an existing diagnosis that simply need follow up visits for monitoring. Many patients are located in rural areas or otherwise underserved by physicians. They must travel long distance to get to a physician office, especially when seeing a specialist. For some patients, this means taking the day off work, which they may not be able to afford. Being able to see their physician virtually not only saves them time and frustration, but saves them travel and opportunity costs as well. To take convenience a step further, asynchronous telemedicine visits don’t have to be done during a workday at all. Patients can complete virtual visits during the weekend, in the evening, or at night. Just because the clinic hours are Monday through Friday, 8 am to 5 pm doesn’t mean patient treatment needs to be limited to this timeframe. Just as asynchronous telemedicine visits are more convenient for patients, they can be more convenient for medical providers. Physicians can review patient details in between patient visits, during random openings in their schedule, or after clinic hours when their paid staff are off the clock. Multiple studies have been published on patient satisfaction with telemedicine, and the general finding is that patients are satisfied with telemedicine. Most patients are at least as satisfied with a telemedicine visit as they are with an in-person visit. And some patients actually prefer virtual visits instead of in-person visits. The speed of completing a store-and-forward visit is another advantage. As already mentioned above, for patients this benefit manifests mainly due to the saved travel and wait time, compared the alternative of seeing the physician in person. For physicians, speed and the associated saved time is one of the biggest, if not the biggest, benefits. While an in-person visit generally takes at least 10 minutes and could take 30 minutes or more depending on the complexity of the patient. Reviewing a store-and-forward visit takes as little as 2 minutes, based on our experience using a store-and-forward platform. Even though the time is significantly less, with store-and-forward telemedicine delivering high-quality care is still possible despite the time savings. Part of the speed advantage for a physician comes from the fact that many top store-and-forward telemedicine solutions are optimized to help the medical provider detect the most common conditions for the given specialty. The way this is done is the by the following: software-driven questionnaires ask the patient targeted questions and, depending on the responses, ask follow up questions that are automatically selected to dig deeper into the patient’s likely conditions. Thus, by setting up an intelligent questionnaire for the patient, the telemedicine system gathers the necessary clinical information. The physician sees all the relevant information in a single glance and is able to quickly make an assessment and treatment plan for the patient. Some store-and-forward telemedicine systems allow the physicians to customize the questionnaires and the information collected from patients. This allows the medical providers to fine tune the information gathered during a store-and-forward visit to exactly match the information they would have gathered during an equivalent in-person visit. This customization may reduce the common complaint about store-and-forward telemedicine that some patient information needed to make a diagnosis may be missing – the medical provider receives exactly what they need from the patient. From a practice perspective, although reviewing occasional online visits provides tangible benefits, even more benefit can be accrued from batching. When a practice sees a significant number of patients as online store-and-forward visits, the physician may sit down once to review all of them as a single batch. For example, a medical provider can sit down for 30 minutes and review about 15 virtual visits, effectively doing a half-day of clinic work in half an hour with minimal to no medical staff. While this isn’t always the case, we assume that most of these visits are routine, with little complexity. Speed and practice efficiency go hand in hand. Store-and-forward telemedicine is a great tool for schedule-challenged patients and physicians. Follow-ups and regular recurring visits are ideal candidates for telemedicine. These types of visits are generally the lowest reimbursed visits by insurance. By shifting these types of visits onto a telemedicine platform, physicians free up their clinic schedule for more procedures, initial visits, and spending more time with their complex patients. Another important consideration for running an efficient practice is learning to manage and deal with cancellations and no-shows. Some clinics may choose to supplement their in-person visits with telemedicine visits for the primary purpose of reducing their in-person no-show rates, smoothing out their schedule, and providing alternatives to their schedule-challenged patients. Doing this may not only increase patient satisfaction across the board, but may also bring in additional revenue from online patient visits which would otherwise be lost. Seeing patients quicker and more efficiently provides an additional community health benefit — patients requiring medical care receive the treatment they need rather than prolonging their medical condition. Let’s list several situations where store-and-forward telemedicine replacement comes in handy. First, let’s address the no-show case. Depending on the practice and the types of patients, some clinics experience no-show rates over 50%. The high no-show rates and the chaos that goes along with them are a major inconvenience for both physicians and patients. Sadly, or perhaps fortuitously, physicians often know which patients will likely miss their appointment based on the patient’s previous appointment-keeping history. In these cases, if appropriate, medical providers could recommend a store-and-forward virtual follow-up visit to such schedule-challenged patients. When other in-person patients do not show up to their original appointment, clinics could also send an invitation for those patients to complete a virtual visit. As much as we’d like to think so, telemedicine isn’t the only solution to addressing high no-show rates. Traditionally, to make up the no-shows, clinics employ several strategies. One strategy is to double book the clinic’s appointments. If you, as a patient, ever had to wait in a clinic for several hours to see your physician, you may be experiencing one of those times when all of your doctor’s patients actually, and unexpectedly, showed up for their appointments. It’s not a good situation for anyone — patients don’t like the wait times, while physicians are under pressure to provide quality care to more patients than they have time for. Another no-show reducing strategy is to charge the patient a fee if they didn’t show up to their appointment. This approach has several logistical challenges. Clinics must collect and store patient’s credit card information and ensure the cards are valid and not expired. When the patient’s co-pay is very low or non-existent, patients may balk at this approach. With all that, the typical fee charged for a no-show will still not make up for the lost revenue of a real visit. Everyone wins if the patient shows up in the first place. The third strategy, although used very rarely, is to “fire” the patient if they are repeatedly not showing up to their appointments and therefore not adhering to medical advice. “Firing” a patient entails removing them from the clinic’s patient panel permanently and not allowing them to schedule any more appointments with that clinic. It is a very unfortunate reality and used only as a last resort. The practice must be fairly established to employ this strategy, and they must be prepared to handle potential backlash from disgruntled patients. Offer to schedule all eligible follow-up appointments as virtual visits. When a patient no-shows for an appointment and they’re eligible for a virtual visit, offer the patient a virtual store-and-forward visit as an alternative way to be seen by their physician. When a patient calls to cancel their appointment, suggest a virtual visit if it is appropriate. When the clinic is falling behind schedule, call remaining patients on the schedule and, if appropriate, offer a virtual visit instead. Patients may be glad to switch, or at least be appreciative for the heads up. Even when people have medical issues, many of them face challenges preventing them from going to the doctor’s office. Maybe they are hoping the issue will go away, maybe they don’t have the time to schedule an appointment or even go to a doctor’s office, or maybe they are embarrassed to admit they have a problem. Whatever the excuse, store-and-forward telemedicine is a tool that can be utilized to help attract these patients to seek care on their own time and in their own environment. Thus, by giving patients access to a new technology for receiving medical care, telemedicine allows physicians to grow their overall patient market. Provide the patient with a likely diagnosis and treatment plan (including sending prescriptions to the patient’s pharmacy). Recommend that the patient come in for an in-person visit based on the need for further evaluation. Provide a possible diagnosis and treatment plan, but schedule the patient for an in-person visit for follow up. Using patient-initiated telemedicine visits allows clinics access to patients that they may not have seen otherwise, thus growing their practice through use of this efficient and mostly untapped mode of healthcare delivery. Since the entire interaction between the patient and physician is digital, all information that the patient enters and the physician reviews are stored on the telemedicine application servers. In addition, due to HIPAA auditing requirements, to be covered in a later article, every data access and change by the patient, physician, and any other provider with access to patient data is logged, along with the time of the access. Thus, the entire virtual patient-physician interaction is tracked in detail, and there is integrity with the information presented to the physician or to the patient. In contrast, real-time telemedicine interactions over phone or video are rarely recorded, from our experience. They are not recorded because these real-time data streams consume lots of digital storage space, and because, except in a few corner cases, the real-time interactions are not needed for later review. The real-time visits are documented just like in-person visits, with notes and updates the medical record. Of course, just as during in-person visits, real-time video and phone discussions open up the physician-patient interactions to often longer discussions that take more time and may not be necessary. Having the entire patient visit digitally stored in the cloud gives additional benefits to the medical community. One such benefit is education. Medical students and residents can be given past real or simulated store-and-forward telemedicine cases in order to practice their skills. This approach allows younger physicians to quickly get a significant number of cases under their belt. The content of the cases could be adjusted for a focused training, giving younger physicians a steeper learning curve. Another benefit of digitally stored telemedicine visits is the convenient access to consultations. Since all the medical information has been gathered and is already available, allowing a physician in another location to take a look at the data can be as easy as adding the consulting physician’s account to the telemedicine system. This often happens when a generalist wants a second look from a specialist, or a specialist wants a second look from a sub-specialist, like a dermatologist consulting with a pediatric dermatologist. Although telemedicine has been around for decades, it is still seen as a new technology. One reason is the rise of new Telemedicine 2.0 applications thanks to the speed of innovation in software and the continuous stream of new platforms on the market. While traditional telemedicine has been used in the past to improve access to medical care in underserved communities, today’s telemedicine is increasingly being used to connect all patients and physicians directly not only to improve access but also to facilitate better continuity of care. This means that software and hardware vendors are increasingly relying on devices that patients already have, such as mobile phones and tablets. Patients are able to use their own devices to complete a virtual office visit from anywhere in the world with an Internet connection. In our opinion, another reason for the perceived newness of telemedicine is the increasing adoption of this technology in the last several years. Although telemedicine has been around for a while, its use has been primarily in academic settings and in the military. Most physicians with established practices have never encountered it, and even some newer physicians have gone through academic programs and residencies without exposure to telemedicine. However, today’s telemedicine companies are marketing telemedicine solutions to hospitals, private practices, and directly to consumers. This exposure does make telemedicine new for these settings and care models. The risks associated with the newness of telemedicine are the same risks associated with any new technology. One recent transition in Health IT has been the transition from paper records to electronic medical records (EMRs). Over 50% of practices now use EMRs. Although these technologies have provided many benefits, many physicians and medical staff still view these systems as clunky and difficult to use. Many clinics and hospitals have adopted these technologies solely to meet the government Affordable Care Act (ACA) requirements and are not too happy about it. How will this impact the quality of service that I provide? Will it actually work as claimed? How much time and effort will I have to spend to figure this thing out? Is using this going to create more work for me? One of the reasons for publishing these articles is to dispel some of these concerns, and to provide education for both medical providers and patients regarding the care models, business models, and technologies behind telemedicine. To address the above questions – yes, telemedicine does work and has the potential to provide tangible benefits for patients, physicians, and practice managers. At the same time, just as with any change, there is a learning curve. Some patients may approach virtual visits with caution, and may choose to stick to in-person visits even if telemedicine visits are available. Some types of patients actually like going to the doctor – it’s a break from work, they like spending some time with their physician and with medical staff, and travel time is not a big issue. Luckily, most of the patients who are cautious about or uninterested in telemedicine will simply not choose a telemedicine visit if given a choice between an in-person and a virtual visit. These types of patients will self-select themselves out of being users of this technology. Here is one more point to keep in mind. It’s important to differentiate between patient satisfaction with telemedicine and patient satisfaction with their treatment plan. Sometimes patients are happy with store-and-forward telemedicine, but dissatisfied with their treatment plan. Have you ever been to a doctor and been asked to fill out the same form and answer the same questions that you did on every single previous visit? How many times must you list the same surgery you had when you were a teenager? One danger every physician faces is insufficient or missing patient information. If a patient forgets to mention a drug they are taking or a medical condition they have, the physician may prescribe a drug that makes the patient worse and not better. One way to mitigate this risk is to ask the patient to fill out their medical information at every visit, so as to better catch any changes or details that may fall through the cracks. A better alternative would be for the patient to simply review, amend, and confirm their medical information with each visit, but some practices may not be set up for such a workflow. The convenience and speed of store-and-forward telemedicine software makes it easy for patients to accidentally skip entering this vital information. For example, if the patient skips reporting a medication, the physician may not catch this error because the patient’s prescription information may be in a separate system (like an EMR) or the physician may assume the patient is no longer taking that medication. When it comes to missing patient information, telemedicine software must support a flow that tries to capture updated medical information from patients to promote patient safety, but must do it in a way that does not disrupt efficiency. The patient information may either be missing because the patient did not enter it, or patient information may be missing because it was not gathered. As we mentioned above when discussing the benefits of store-and-forward telemedicine, some solutions use intelligent questionnaires that are optimized to ask specific questions for the most common medical conditions for a given specialty. There is also a potential benefit for patient information with telemedicine. Since many patients will be completing their virtual visits from home, they may have ready access to their medications. This means if they don’t remember the exact name of the medication that they are taking, they could go and take a look at the prescription container. Just as physicians may find the patient information insufficient, patients may likewise find the physician response and treatment plan insufficient. Patients may have questions and clarification requests after their virtual visit is complete. Although a bit inconvenient, there are a couple approaches to help handle these patient questions. One approach is to encourage patients to call the clinic with any needed clarifications. Another approach is to use a messaging feature, common to many telemedicine applications, where patients can send messages to their physician. Some telemedicine applications may limit the number of messages or the amount of time after the virtual visit when such messages can be sent. Some physicians have voiced concern that some patients may abuse the follow-up messaging and support service. However, this approach is not significantly different from existing approaches, such as a clinic’s on-call service or message sending through a patient portal. One of the most common questions we hear when speaking with potential customers and business partners is: “Is it covered by insurance?” The simple answer is: “Yes, in many cases.” But, as with most things in health care, the answer is more complex. Most states now have telemedicine parity laws — these laws dictate what types of telemedicine must be covered by insurance, and sometimes, what the reimbursement rate should be for those visits. The types of telemedicine covered include not only telemedicine categories, such as store-and-forward versus asynchronous, but also may even have different rules for different specialties, with mental health being the primary example. For instance, laws may address real-time video visits but not store-and-forward visits. Laws may address coverage for follow up care but not initial diagnosis. Laws may dictate that the insurance reimbursement rate must be the same for in-person visits as for telemedicine visits, or they may leave the exact reimbursement flexible. In addition to mandated reimbursement and coverage, insurance companies themselves maintain separate divisions that may maintain separate insurance policies for each state. So if one insurance company reimburses store-and-forward telemedicine visits at one rate in one state, that is not necessarily the case for a different state. In addition, some insurance companies and self-insured organizations view telemedicine as a competitive advantage – a way to reduce healthcare costs and improve population health. One example is Home Depot. Thus, regardless of state laws, these forward-looking entities may decide to always reimburse telemedicine. They may even offer telemedicine visits for free to their members, going beyond of their state’s minimum requirements. Thus, unless the clinic only accepts cash or telemedicine is explicitly not covered in their insurance contract, either the telemedicine vendor or practice has to deal with insurance. For virtual follow-ups, the clinic will already have the patient insurance information on file. In this case, assuming the telemedicine co-pay and payment schedule from the insurance company is already known, the medical staff can directly set the patient’s co-pay when scheduling a telemedicine visit. For patient-initiated visits, the telemedicine software must gather the patient insurance information directly from the patient. Then, either the clinic staff or the telemedicine vendor must determine eligibility and submit the insurance claim. We hope that in the next several years all insurance companies will provide eligibility and co-pay details in real-time. This will benefit the patient because they will know up front how much a virtual visit will cost. Currently, if the insurance eligibility and co-pay details are not already known, the clinic must submit the claim before knowing the reimbursement amount and patient portion of the visit. Since in these cases the final charge may not be determined until days or weeks later, we recommend alerting the patient up front what their maximum financial responsibility could be. Just like every state has different medical insurance policies, every state also has their own malpractice insurance policies and vendors. Malpractice insurance vendors may or may not cover all categories of telemedicine, care models, and specialties. The physician or telemedicine provider must check with the malpractice insurance company to see what they cover. The best telemedicine vendors will check with the top malpractice insurance providers in the state ahead of time and already have this information for potential customers. That said, even if malpractice insurance does not cover certain care models, a large enough practice could self-insure for telemedicine visits. In addition, some telemedicine providers are offering their own telemedicine malpractice insurance for physicians using their products. So far, telemedicine has had very few reported malpractice cases. As of 2015, Teladoc, a company that has been offering telemedicine visits for over 10 years, has not had a single malpractice insurance claim. Store-and-forward telemedicine provides new ways to interact with patients. Some of these ways may cause workflow conflicts with existing systems used by clinics. Many clinics have a doctor on-call after hours. If a patient has a question or concern, they can reach the on-call service when the practice is closed. (This, by the way, is a classic example of real-time telemedicine.) Some existing patients may use the on-call system to receive care for new conditions. For example, a patient with itching bug bites may call and get a prescription from the on-call physician. In most cases clinics do not charge for their on-call service. The physician could, at their discretion, ask the patient to come into the office instead of providing treatment directly over the telephone. So, for clinics that may use patient-initiated store-and-forward telemedicine, the patient seeking non-urgent medical treatment after hours could do so simply by staring a visit from the clinic’s website. From a financial perspective, the medical practice will likely make more money if their patients use virtual store-and-forward telemedicine instead of using the on-call number. But, from a patient satisfaction standpoint, some patients may want the option to speak with a real live doctor. In addition, most patients know that on-call services are free, so why would they ever agree to pay for a store-and-forward telemedicine visit? There is no easy solution here. Practices that come across this issue will need to take steps to resolve this conflict so that they offer consistent service and pricing across all of their care models. Another patient interaction system commonly employed by clinics is a messaging system, typically via a patient portal. Technically this type of interaction is considered store-and-forward telemedicine of the simplest type – simple messages that may or may not provide enough medically relevant information to the physician. From our experience, patients typically use this system for either simple follow up questions regarding their previous visit or queries prior to their next visit. Since this type of messaging is open-ended and does not provide a structured flow, it is possible that patients may be more likely to overuse this type of system compared with a telemedicine platform that utilizes specific questionnaires. Today’s clinics and hospitals use a multitude of software products and services such as EMRs, payment and billing systems, scheduling systems and patient portals to name a few. A store-and-forward telemedicine system adds to the existing technological burden on physicians and medical staff. It is another system to learn, another set of username and passwords to maintain, and another system that patients will ask questions about. Just as with other systems in the clinic, the medical staff will need training. Adopting telemedicine within an existing private practice or healthcare system is an organizational change – every member of organization, including physicians, mid-level providers, office managers, and medical staff must be on board with and learn new workflows. Due to the needed “buy in” and participation of multiple parties involved, telemedicine implementations have the potential to be quite challenging. During staff training and ramp up, telemedicine vendors and key medical personnel must communicate the benefits of telemedicine, including benefits to the patients and clinic/healthcare system so as to not lose focus on the overall goal. For a successful telemedicine implementation, a healthcare organization should also have a physician telemedicine champion in charge of leading the way by: 1) utilizing telemedicine whenever appropriate, 2) being able to communicate the benefits and reasons for using telemedicine to their peers, and 3) working with the telemedicine vendor to develop best practices and flows for their organization. If an organization adopts telemedicine without a physician champion, then this effectively means that the practice is relying on patients to be champions – to request telemedicine visits from physicians or to start telemedicine visits on their own from a participating practice’s or vendor’s website. However, in order for patients to request a telemedicine visit, the patient must be informed and convinced that a virtual visit is the right path for them. And here we have a potential conflict – patients may be extremely willing and eager to use the clinic’s telemedicine offering, but the clinic staff may not inform them that such a service is available because they’re not sure if the patients really want it. Our recommendation is if a practice or healthcare system chooses to offer telemedicine that they make sure to provide the patients with plenty of information regarding this service so as to make its availability well-known. For example, placing telemedicine brochures in the patient waiting area is a good start. We’ve seen plenty of patients, even some elderly, embrace telemedicine visits when offered the choice. Otherwise, without having either a strong physician drive or a patient education campaign, the practice will likely not reach a meaningful volume of telemedicine visits. For private practices and organizations exploring using telemedicine, we recommend speaking to a medical provider who implemented telemedicine in their practice and can elaborate regarding the everyday benefits and challenges of their implementation. The top telemedicine software vendors should have a staff or consulting physician available to help assess the risks, organizational changes, and specific next steps needed to achieve a successful transition to a hybrid practice. Patients may have a virtual visit scheduled in the telemedicine system and an in-person visit scheduled in the regular system. Patients pay through the telemedicine system, and their payments must be reconciled with the regular payment system. Patient demographics are stored in both telemedicine system and EMR. If a patient updates their demographics in the telemedicine system, it must be synchronized with EMR. Patient allergies, medications, medical histories, and preferred pharmacies are stored in multiple systems. Physician could electronically send prescriptions from the telemedicine system or from their existing e-prescribe solution. After the patient completes a store-and-forward telemedicine visit, a summary of their encounter and updated medications must be uploaded to the EMR so that the continuity of care requirement is met. Although there are quite a few items and workflows as listed above that could potentially duplicated, there is a solution here. The solution is to fully electronically integrate the telemedicine software with clinic’s existing systems. By using HL7, FHIR, APIs, and other methods, a fully integrated telemedicine application will keep itself in sync with the clinic’s existing systems. This includes things like pulling in patient demographics when needed, updating patient encounter notes and medications, updating billing, posting virtual follow up appointments in the scheduling system, etc. Hence, when the telemedicine solution is fully integrated into the clinic’s workflows and systems, many friction points can be eliminated. Transitioning from an in-person-only private practice to a hybrid practice that also accepts telemedicine patients requires changes in work processes and technology. Oftentimes existing systems must be evaluated to see whether they fit with this new way of doing business. It may be that some existing systems, such as patient portal messaging or billing, do not fit into the new organizational workflow. In that case, these systems must either be upgraded/modified, replaced with another system, or, when functionality is already accomplished by other systems, completely eliminated. A monthly or yearly ongoing fee, which may be per provider or per clinic location. Revenue sharing – the telemedicine vendor either takes a percent or a set dollar amount of each telemedicine patient visit. In addition to the above-mentioned standard fees, the telemedicine vendors may charge for additional features such as EMR integration, e-prescribing, white labeling, insurance eligibility lookup, etc. In general, telemedicine vendors typically do not publicize their prices because many of their customers have unique requirements. Some clinicians may view telemedicine as a way to make medical treatment affordable for the patients, while others position their virtual visit offering as a premium service. Some clinics may only want to use telemedicine for low-risk follow up visits, while others see it as a marketing opportunity to attract new patients in the area. The physician must consider the cost of the solution and whether it makes sense for their practice. For those clinicians who are not sure whether telemedicine is for right for them because they are not sure how often they will use it, the % of visit fee pricing model makes the most sense. This allows the physician to try telemedicine essentially cost and risk-free. And, as the clinic increases volume of their telemedicine visits, the revenue share approach may no longer make financial sense. In this case, a practice should choose a recurring monthly fee option. In summary, store-and-forward telemedicine offers many benefits to patients and clinicians, including convenience, speed, and efficiency. However, clinics must also consider the potential challenges of integrating this technology into existing workflows. John D. Whited, “Summary of the Status of Teledermatology Research,” Teledermatology Special Interest Group American Telemedicine Association, Durham, 2015.